Peterborough Town paceman Joe Dawborn after his sensational 10-wicket display at Brixworth. Photo: courtesy Brixworth CC. Pace ace Joe Dawborn became the first Peterborough Town player to take all 10 wickets in an innings in the top flight of the Northants League since 1978 today (July 25). Dawborn’s display was described as ‘sensational’ by Town professional Paul McMahon as the 21 year-old confirmed his reputation as the deadliest bowler in the competition. 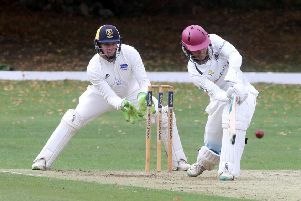 Dawborn, whose dream is to break into the first-class game, needed just 10 overs and three balls to dismiss 10 Brixworth batsmen as Town steamrollered their opposition by 158 runs. Six of his victims were bowled, two were adjudged lbw and two were caught. His final, career-best analysis, of 10.3-5-22-10 is understood to be a record for the Premier Division. Brixworth didn’t know what hit them as they set out in pursuit of Town’s 241-8 declared. The home side are the only team to stop leaders Rushden winning this season on a day when they passed 300. But they were soon 0-2 thanks to Dawborn and it was a sorry procession back to the pavilion that continued for 90 minutes. Only opener Alex Lacey (42) put up a fight against a bowler who can swing the ball at high speed in either direction. Dawborn passed 50 wickets for the season during his demolition work. His tally of 52 victims is the most in 15 divisions in the Northants League this season. Surprisingly, given his reputation, Dawborn’s previous Northants League best was 6-11. He has taken 8-28 in a Minor Counties Championship match. It’s great form to take into a three-day game for Northants seconds at Derby that starts on Monday (July 27). Earlier Town had overcome some early difficulties to post a formidable score. David Clarke anchored the innings with 67, while Marcus Howard (40), Paul McMahon (54no) and Lewis Bruce (40) battered the boundary boards. McMahon and Bruce added 78 for the sixth wicket against a tiring attack. Town remain second in the table as Rushden also collected 30 points after securing a big win. Town are five points behind a team they face on August 8. Seamer Dave Remnant is the only other Peterborough Town bowler to take all 10 wickets in a Northants League top-flight game. He claimed 10-42 against Corby. Bowling: R. Mclean 6-2-29-1: F. Newborough 12-1-44-1; A. Pruthab 12-1-40-1; C. Sibley 14-1-68-2; C. Sibley 14-1-68-2; A. Starmer 9-0-55-3. Bowling: J. Dawborn 10.3-5-22-10; J. Smith 9-2-52-0; K. Jones 1-0-1-0. Oundle warmed up for tomorrow’s (July 26) Northants Twenty/20 Finals in fine style with a seven-wicket Premier Division win over Old Northamptonians today (July 25). ONs recovered from 99-8 to post 167-9 in 55 overs at Milton Road, but that total was made to look rather inadequate by big-hitting Zeeshan Manzoor. Batting at number 10 Zeeshan smashed 98 from just 75 balls as Oundle won with 22 overs to spare. Manzoor struck five sixes. Earlier Bashrat Hussain (4-36) and Petrus Jeftha (3-64) had bowled well for Oundle. Old Northamptonians 167-9 (P. Evans 42no, B. Hussain 4-36, P. Jeftha 3-64). Oundle 168-3 (Z. Manzoor 98, P. Foster 23).